What do you wear Keds canvas sneakers with? Keds sneakers are a staple with children, teens and adults. They look great with everything and are comfortable to boot. The best types of outfits to wear with Keds sneakers are casual and fun; spring and summer looks. But, it is also interesting to change it up a bit and pair your Keds sneakers with a floral dress or denim skirt. Keds sneakers come in all colors of the rainbow. But, their most famous and most popular shoe is the white Keds sneaker. Red Keds look great with jeans and jean shorts and navy Keds pair amazingly with Capri white jeans or a summer dress. Always remember that Keds sneakers look best with no socks or very low socks. This looks both clean and chic. 1. There is nothing better than wearing your all-around great looking white Keds sneakers with slouchy Capri pants in beige. A white shirt tops off this look, along with a black jacket. This entire outfit is great for spring afternoons going shopping or even to a barbecue. The idea is that it is a relaxed look that is both fashionable and cute. White Keds sneakers with beige Capri pants. 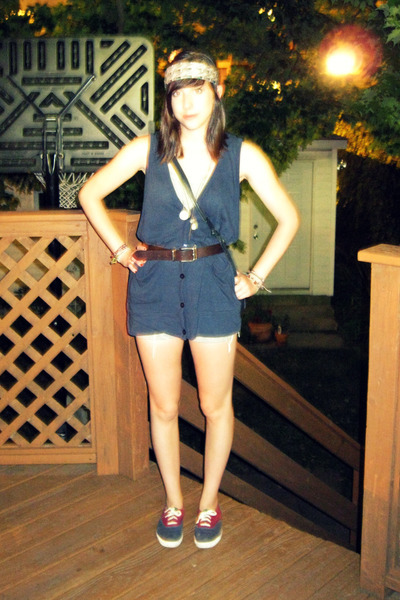 The other outfit, paired with the popular white Keds sneakers is a casual blue dress and a scarf. The scarf brings a pop of color to the ensemble and the bright blue looks great alongside the stark white of the Keds. This outfit is easy to wear and looks very comfortable. Both of the ladies in these pictures decided to wear their white Keds sneakers sans socks; which looks perfect! 2. This lady knows how to wear her navy Keds beautifully. She is wearing a white dress with navy piping and a navy bow. She added a pink bracelet for some color along with a navy blue headband. She looks put together and pretty. This outfit is perfect for a spring or summer day. A white dress with navy piping and a navy bow. 3. Red Keds look great with navy blue. Wearing a navy blue dress is the perfect addition to red Keds. The dress looks casual, but unique with its asymmetrical hemline. The dress could almost look elegant, but pairing it with the red Keds puts the outfit into a class of its own. The red Keds bring a lightheartedness feel to the dress and this ensemble could go from day to night easily with no changes or additions. 4. Pairing multicolored Keds sneakers with a romper is the perfect daytime outfit. The Keds are blue and maroon and look great paired with a romper complete with a brown belt and head wrap. The necklaces and purse complete the casual, but stylish outfit. Multicolored Keds look best when paired with solid colors, especially when one of the colors of the shoe matches the color of the outfit. 5. Pairing navy Keds sneakers with red shorts and a navy printed t-shirt looks different and amazing. The navy Keds are comfortable to wear and adding the red shorts adds a fun twist to the usual denim shorts. 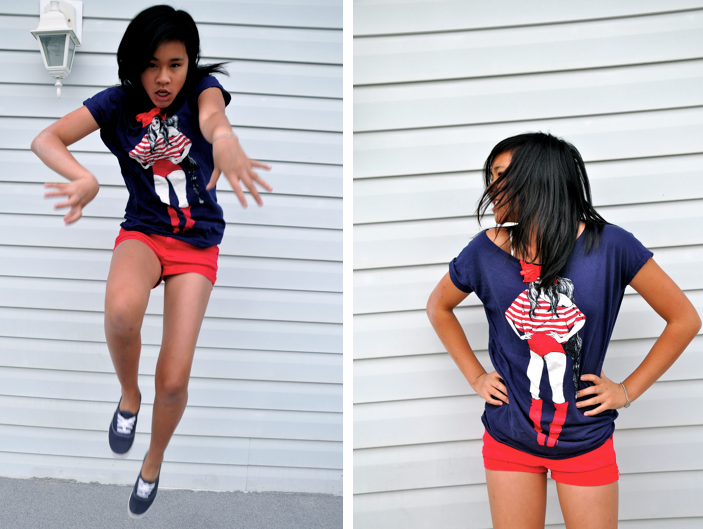 The printed t-shirt accompanies the navy Keds and red shorts well and balances out the look. 6. Keds can even be paired with winter attire. These Keds sneakers look great when paired with rolled up pants, a scarf and a long cardigan. The fact of pulling the hair into a bun and sunglasses make this look very fashionable. When winter comes around, don’t put your Keds sneakers in the back of your closet, and pair them with your sweaters and even jackets. The best rule of thumb for this look is to layer separates for a slouchy feel and roll up your pants to show off your Keds. 7. Red Keds paired with a black skirt, polka dot tights, a striped shirt, blazer, suspenders and a pirate styled hat is reserved for the bold. Personally, I would take off the tights, suspenders and hat and there is a very cute outfit lurking within. Wearing it all together is definitely noticeable, but not for everybody. Although, red Keds paired with black and white, a skirt and a blazer looks distinctive and well put together. Anyways, just keep experimenting with new styles for keds and sneakers! It’s when you are bold and brave you attract a lot of attention! ← What are the current sneaker fashion trends for Women? Hi, it’s never bad to wear cool sneaks. Do not worry about what other people think. What goes good with polka dot keds? The one with the dark blue or black background color. Well, if you want to have the polka dots color, you can chose an outfit that either contrasts the color of your shoes. In your case, you can go with the color of the polka dots or the color of the background. On the other hand, you can also choose a color that looks good when worn with any of the colors present in your keds (e.g., red dress if your keds is black in background and white polka dots). Hope this helps! Personally, I would go with anything plain and has the color of the polka dots or the background 🙂 Of course, you can wear something else like a contrasting color of the two. Thanks for getting interested in the topic!